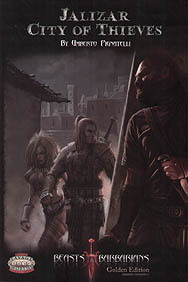 Jaszar, City of Thieves, the Rotten Flower of the North, is revealed to your eyes in this book! In its pages, you'll learn the seedy ways of the Thieves' Guild. You'll smuggle goods into the city, fooling the Copper Helms, the corrupt city watch of Jalizar, vie for power with the Merchant Houses or, if you are really bold, venture into the dark Sewers of Jalizar where an age-old evil lurks undisturbed. Twenty new Edges, new trapping and tweaks for the arcane backgrounds, and additional list of gear, and much more await you in this book! So sharpen your dagger, put on your lack cloak, and step outside into the dark alleys of the City of Thieves!